How is Elmo Magalona’s relationship with Janella Salvador’s mom Jenine Desiderio? Elmo Magalona happily shared that everything is getting better between him and Janella Salvador’s mother Jenine Desiderio. It may be recalled that Jenine recently made headlines for her loaded tweets about a mystery guy who is being linked to her unica hija. Jenine didn’t name the person she’s pertaining to but many were quick to assume that she was pertaining to Elmo. But, during Janella’s digital concert, Jenine surprised the crowd by introducing Elmo as someone who supposedly makes her daughter happy. READ: Did Jenine Desiderio reveal Elmo Magalona makes her daughter Janella Salvador happy? “Sometimes she texts me out of the blue, na something so random and then I answer her tapos ‘yun pala she was telling me a joke,” he shared. The Kung Kailangan Mo Ako star admitted that he never expected such kind of treatment from Janella’s mother. “So I’m happy kung saan na napupunta ‘yung relationship namin ni Janella,” he ended. 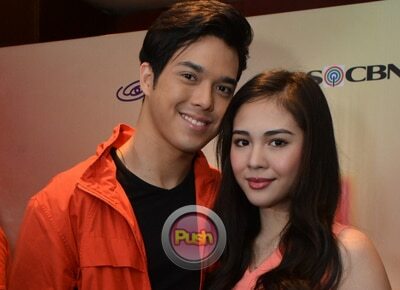 Elmo recently updated that he and Janella are very happy and that they are now closer than ever. He even shared that he gave her a gift prior to leaving for the US for a series of shows.